People often ask how to do iteration in Puppet. Most Puppet users have a background in imperative programming, and are already very familiar with for loops. Puppet is sometimes confusing at first, because it is actually (or technically, contains) a declarative, domain-specific language. In general, DSL’s aren’t always Turing complete, nor do they need to support loops, but this doesn’t mean you can’t iterate. Until recently, Puppet didn’t have an explicit looping construct, and it is quite possible to build complex modules without using this new construct. There are even some who believe that the language shouldn’t even contain this feature. I’ll abstain from that debate for now, but instead, I would like to show you some iteration techniques that you can use to get your desired result. If you really want to Push Puppet, even more advanced recursion is possible. In general, I haven’t found this technique very useful for module design, but it’s worth mentioning as a form of iteration. If you do find a legitimate use of this technique, please let me know! Which will cause Puppet to effectively iterate across the elements in $users. This is the most important type of iteration in Puppet. Please get familiar with it. # using the type requires that you pass in $some_array twice! While this example might seem contrived, it is actually a modified excerpt from a module that I wrote. This creates each user resource with its own arguments. If an argument isn’t given in the $data, it is taken from the $defaults hash. A similar example, and the official documentation is found here. Use your imagination! Remember that you can also write a custom function if necessary, but first check that there isn’t already a built-in function, or a stdlib function that suits your needs. When you really need to get fancy, it’s often time to call in a custom function. Custom functions require that you split them off into separate files, and away from the module logic, instead of keeping the functions inline and accessible as lambdas. The downside to using these “inline_template” lambdas instead, is that they can quickly turn into parlous one-liners. As with simple template iteration, the key problem is transferring the data in and out of the template. In the simple case, arrays can be joined and split as long as there is a reserved character that won’t be used in the data. For the advanced template iteration, we rely on the YAML transformation functions. If you properly understand the functionality that your module is trying to model/manage, you can usually break it up into separate classes and defined types, such that re-use via type iteration can fulfill your needs. Usually you’ll end up with a more properly designed module. Test using the same version of Ruby that will run your module. Newer versions of Ruby have some incompatible changes, and new features, with respect to older versions of Ruby. Remember that templates and functions run on the Puppet Master, but facts and types run on the client (agent). The Puppet language is mostly declarative. Because this might be an unfamiliar paradigm, try not to look for all the imperative features that you’re used to. Having a programming background can help, because there’s certainly programming mixed in, whether you’re writing custom functions, or erb templates. For completeness, I should mention that the future parser now supports native iteration. If you need it, it probably means that you’re writing a fairly advanced module, and you’re comfortable manual diving. If you have a legitimate use case that isn’t possible with the existing constructs, and isn’t only a readability improvement, please let me know. I hope you enjoyed this article. 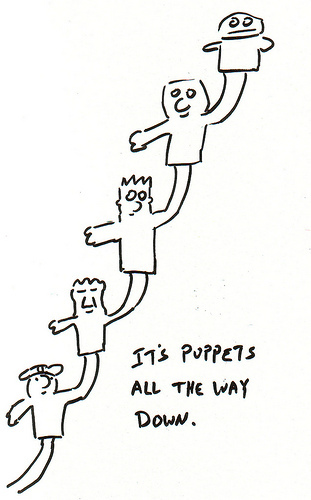 The next time someone asks you how to iterate in Puppet, feel free to link them this way.